Midweek, we had almost written this weekend off due to an unsettled forecast but between e-mails I told Rod "lets just keep an eye on the weather closer to the time" I guess my confidence in the forecast was just as low but you never know it might just change. Come Thursday the weekends forecast had changed then come Friday we even had a bit of sun in the mix. With a green light to walk I e-mailed Rod (sadly David won't be joining us today) a couple of Birkett walks to choose from one of which was the Bannerdale Horseshoe and the other was this walk; Place Fell round. I think it may have been last year when myself Rod and David were descending High Dodd via Scalehow Beck when Rod stopped while looking over at Low Birk Fell, in a muffled silence Rod pointed out with his finger Low Birk Fell, Smeathwaite and Bleaberry Knott, seconds later he explained his route which he taken some years ago whilst completing his own Birketts, I'm not sure what happened at that precise moment but even after the conversation had ended and we had turned away, I found myself still looking at those tops, I guess for me, this was the moment when my Birkett dream started. 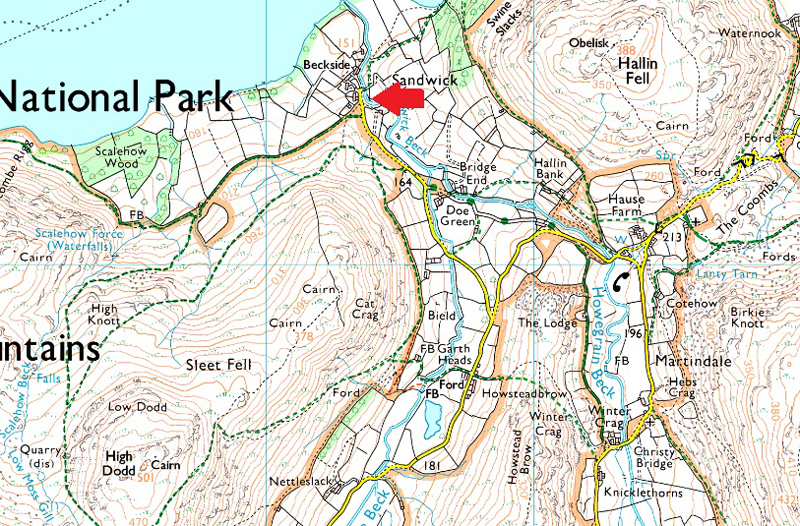 Notes: Head into Sandwick and find the parking spaces on the grass verge at the end of the lane opposite Town End Cottages. There is room for up to five/six well parked cars, please park considerably. Parking is free. While on route to meet Rod and Michael at Martindale New Church I couldn't resist stopping off at the Duke of Portland Boathouse to take in this fantastic view down the lake. Due to the limited parking at Sandwick we had agreed to first meet at the car park next to Martindale New Church at 08:30am. Rod and Michael had already arrived by the time I got there and no sooner had I opened the door I was being congratulated after becoming a Grandad to baby Penny Rose who was born on the 4th August. We agreed to drive to Sandwick in my car so after we loaded up we drove the short distance whilst I explained to Rod and Michael with this glint in my eye just how special being a Gandad is. The grass verge opposite Town Head cottages was empty leaving me to park easily so I nudged the car in front end first. It wasn't exactly quiet owing to two or three young kids who were playing on bikes at the end of the lane, guests from the holiday cottages no doubt. Rod and Michael were already ready which left me just to lace up. It's notably cooler tinging on mild so jackets are packed neatly into packs before setting off. With my car locked we followed the path alongside the stone wall towards the footbridge over Scalehow Beck which is now part of the Ullswater Way. Gowbarrow Fell from the footpath. It was Michael who spotted the Deer in the field in the distance, sadly too far away for a close up. Passing the old barn on route to Scalehow Beck. This old barn is mentioned by Bill Birkett which has now been converted into the Lowther Barn Tea Room, sadly we're too early for a brew, note the Deer fence alongside the stone wall. Low Birk Fell from the footpath. The footbridge over Scalehow Beck is down there over on the left. That's Low Birk Fell up ahead with its lower slopes covered in thick bracken, we aim to ascend directly between the crags higher up the slope. What we don't know yet is we are about to come face to face with some of the highest bracken any of us had encountered. Foot bridge over Scalehow Beck. This is a very popular spot for anyone using the footpath between Sandwick and Patterdale, it might seem peaceful now but come a few hours time and you'll be hard pressed to find a place to rest up. Beyond the bridge the path rises slightly, it is here we need to be on the look out for the path we're going to ascend Low Birk Fell by. Looking back while taking in the long distant view over Ullswater. At the time I took this photograph I could only just see the top of Rods head with Michael somewhere behind. The bracken here was over head height and so thick it stopped us in our tracks, it wasn't a case of working our way through but fighting your way through, it's fair to say that once clear we all stopped to lick our wounds which ranged from grazes to small cuts which in my case drew blood! We reckoned the bracken here in some places was at least six feet in height which of course when you go home to tell your friends and family then exaggerates to at least ten feet! Gowbarrow Fell from the ascent of Low Birk Fell. Taken during the ascent of Low Birk Fell, would you believe that just three days ago the forecasters were forecasting heavy rain this morning. It's only when viewed from this angle does The Knight resemble a miniature Matterhorn, however from the summit of Bleaberry Knott, The Knight looks completly different having taken on a whole new shape. Ullswater, Swinburns Park and Little Mell Fell from Low Birk Fell summit. We followed a narrow defined path after steeply gaining the top of the crags then steered northerly where we picked up a series of grassy knolls which lead towards the summit cairn. The views during our ascent were outstanding and more than made up for our encounter with the bracken earlier. 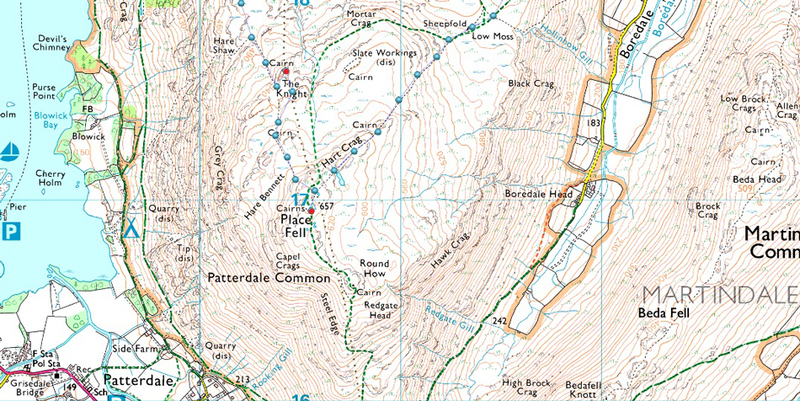 Place Fell (L) The Knight (C) Bleaberry Knott and Smeathwaite from Low Birk Fell. Instead of dipping into the hollow we maintain height by following the ridge where we flank Kilbert Howe to our right before picking up a narrow path which passes over the craggy outcrop seen centre right, it's from here do we start our ascent on Smeathwaite before going on to summit Bleaberry Knott. Looking over Scalehow Beck towards High Dodd from Low Birk Fell. I must admit I was feeling pretty nostalgic as I peered over to the spot where I first got my inspiration to do the Birketts. Looking back on the grassy ridge incoporating Kilbert How (L) and Low Bank Fell far right. What a beautiful morning it's turning out to be. The view towards The Knight and Place Fell from the ascent of Smeathwaite. We ascend steadily via a grass rake from the foot of the fell which gained height over more craggy outcrops before shouldering the summit. From Smeathwaite you do get a good feel for the lay of the land as The Knight still maintains its conical shape, but not for long. Instead of heading straight for Bleaberry Knott we detoured right towards the edge of the ridge and took in the views into hanging valley of Glencoyne. The hanging valley of Glencoyne. With Sheffield Pike to the left, Glencoyne Head centre and Hart Side seen right. It dosnt seem to minutes since we did our Glencoyne Traverse which was actualy back in May. The unmistakable Catstye Cam with Helvellyn under shade from Bleaberry Knott summit. That's Birkhouse Moor seen in the foreground with Nethermost Pike far left, moving right we have Helvellyn, Lower Man, Whiteside, Sheffield Pike and finally Glenridding Dodd. The view over Glenridding towards Birkhouse Moor, Catstye Cam and Helvellyn from Bleaberry Knott. It was whilst I was taking this image did Rod shout out "Deer" who had come up from the ground above Birkfell Earth, I only managed a few hurried shots not wanting to miss the herd which included around fifteen stags so I chose to look on Instead, the herd looked back at us before heading off towards the top of Low Moss Gill, that's around half a mile of ground covered in just four minutes. Rod however, was much quicker on the trigger. Place Fell and The Knight from Bleaberry Knott. The Knight looks incredibly different from Bleaberry Knott seen as the craggy high ground below Place Fell summit. A view into Grisedale from Bleaberry Knott. With Birks and St Sunday Crag over on the right. The northern tip of Ullswater from The Knight summit. With Bleaberry Knott now behind us we followed a narrow path over sometimes boggy ground which soon started to rise steeply below The Knight summit, once the shoulder was gained it's just a case of heading left onto the narrow summit ridge, phew, time for a quick rest before we move onto Place Fell. Having left The Knight we picked up the narrow path once more and we were lucky enough to spot a Buzzard who swooped down and came to a sudden stop to our right before turning around and flying off back in the direction it came, a nice display to take the mind off the ascent. Soon after we reached the summit we were met by a cool wind which was much breezier than anything we'd felt all morning, nevertheless the wind helped to cool things down before we took the slight descent to the Tarn just below the summit. 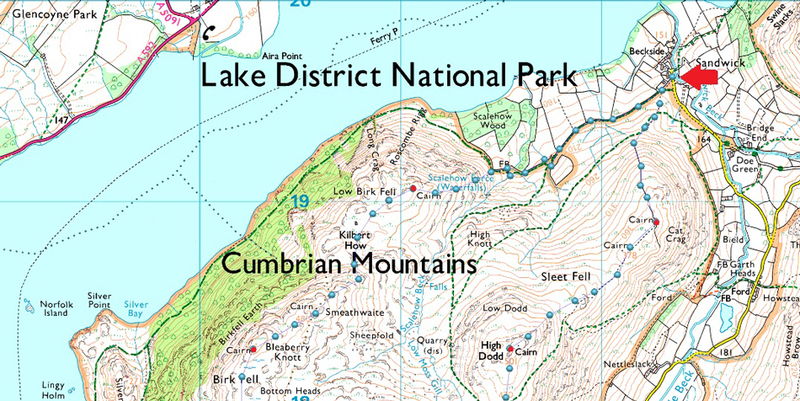 The Tarn is nameless on the OS Maps although it's affectionately known as Place Fell Tarn. Such a lovely spot especially when the sun is out. High Dodd comes into view once again as we descend Place Fell. That's Hallin Fell directly behind with Bonscale Pike over on the right. Ullswater and Hallin Fell from High Dodd summit. The ground underfoot levels once a sheepfold is reached which is where we passed a couple and their dogs, we weren't sure if they were making an out and back from Place Fell having thought we'd seen them earlier, either way 'mornings' are passed before taking on the lovely stroll onto High Dodd. Sleet Fell and Hallin Fell from the descent of High Dodd. The descent being much steeper than we'd all remembered! The view back to Place Fell from Sleet Fell. No cairn marked the highest point of the summit at 378' instead continue to the end of the ridge where this cairn, and a larger cairn can be found to the right. I must admit out of all the summits we've visited today Sleet Fell was up there with the best. Hallin Fell seen above Sandwick. From Sleet Fell we bare left and follow a worn grassy path alongside a stone wall. The stone wall falls away further left while the path keeps to the ridge, steeply we descend through pockets of hot air while watching walkers on the path below we had walked on just under four hours earlier.. It was spoke of that that the ill informed forecast had probably kept many a visitor away having only passed just two people the whole morning. Back on the path we arrive back in Sandwick passing two fell runners. My car is now sandwiched between two other cars amongst others and Sandwick for now, seems to have lost that hamlet feel as people go about their business. With the gear squashed back in to my car we drive back to Martindale New Church finding a full car park, most drivers turn away while others squeeze into the tightest of gaps. Gear is swapped back into Rods car while being watched by people eating lunch on the lower slopes of Hallin Fell. Rod and Michael are about to join them but I'd already told the lads I was going to skip lunch and maybe grab a bite on the drive home.